Applications include water well, deep hole water well, water well casing, shallow oil & gas, exploration, construction, blast hole and exploration. The Mincon MC60 is a superior but versatile hammer, specifically built for drilling applications where high penetration speeds are vitally important. It's unique design concept provides much greater impact energy and ultimate drilling performance for absolute maximum productivity in almost all ground conditions. 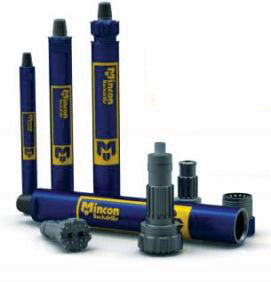 The Mincon MC series drill bits do not use foot valves (blow tubes) and therefore any problems previously associated with them are completely eradicated. The multi-splined, full length drive bits are designed to extend the wear life of the the bit shank. Like all Mincon DTH hammers, the Mincon MC60 maintains an excellent operating pressure over an extended service life and overall is the tool you require to get the maximum out of all your equipment. Mincon products are all manufactured in house (Ireland) and all processes are carried out under one roof. This guarantees that the quality you expect is always delivered. Patented shank design is fully supported within the chuck throughout the stroke providing maximum protection against shanking. The Mincon 8DH is a universal hammer that can be used in almost any drilling application. It is a field proven technology that delivers superior penetration rates versus other manufacturers. Like all Mincon DTH hammers, the Mincon 6DH maintains an excellent operating pressure over an extended service life and overall is the tool you require to get the maximum out of all your equipment. Mincon products are all manufactured in house (Ireland) and all processes are carried out under one roof. This guarantees that the quality you expect is always delivered. Unique manufacturing processes extend internal components life allowing for multiple rebuilds in abrasive conditions. Valveless operation to maximize energy output, provide efficient air utilization and reduce service requirements. Extra air-flow system allows for better hole cleaning in troublesome holes. The Mincon 8DHSD8 is a universal hammer that can be used in almost any drilling application. It is a field proven technology that delivers superior penetration rates versus other manufacturers. Like all Mincon DTH hammers, the Mincon 8DHSD8 maintains an excellent operating pressure over an extended service life and overall is the tool you require to get the maximum out of all your equipment. Mincon products are all manufactured in house (Ireland) and all processes are carried out under one roof. This guarantees that the quality you expect is always delivered. The Mincon MP80 is a universal hammer that can be used in almost any drilling application. It is a field proven technology that delivers superior penetration rates versus other manufacturers. Like all Mincon DTH hammers, the Mincon 6DH-LV maintains an excellent operating pressure over an extended service life and overall is the tool you require to get the maximum out of all your equipment. Mincon products are all manufactured in house (Ireland) and all processes are carried out under one roof. This guarantees that the quality you expect is always delivered.